You’ll never guess what today is….. Pig in a Blanket Day is a day to eat a sausage wrapped in a pancake. Why? Because that’s what “Pig in a Blanket” is. Somebody, somewhere decided that this was a very special treat for them. So, they created a special day to celebrate this culinary delight. Aren’t you glad that they did? 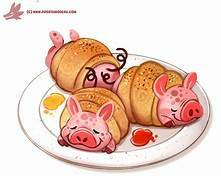 How does one go about celebrating Pig in a Blanket Day? Cook up some sausage. Make some pancakes. Wrap the sausage inside of the pancake. Add maple syrup. Then, chow down. Our research did not find the creator or the origin of this day. Restaurants sometimes hold a “Pig in a Blanket” special. The roots of this day may have come from a restaurant breakfast promotion. OBVIOUSLY, THIS SOURCE IS NOT FROM WESTERN PA! THIS IS A WEAK VERSION OF A “PIG IN THE BLANKET”! Right, younz guys? We’re Gettin’ Jazzy With It! Coming in May……..